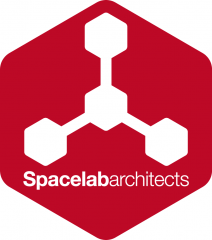 The Spacelab Firm has a brand new logo. At first sight it’s an iconic mark, an hexagon with a curious white picture inside. But it’s also an open cube in axonometric view, containing an X-Y-Z diagram (as architects, Space is our daily subject). Origin and ends of the axes are four “entities” – cubes too, representing the four founders of Spacelab Architects, directly connected each other. Down in the hexagon, the words “Spacelab Architects” in a dry and objective Helvetica font. All others recalls to sci-fi, or to the space-modules collective imagination are, I swear, unintentional. Or it isn’t so?